At each step of my healthy living journey, I learn something new and do the best I can with what I know. When I learned about off gassing, I was mortified, knowing my kids were sleeping on mattresses that could have high levels of toxicity. After all, I work really hard to provide my kids with a low-toxin life with healthy food, natural home and body care products, and key supplementation. 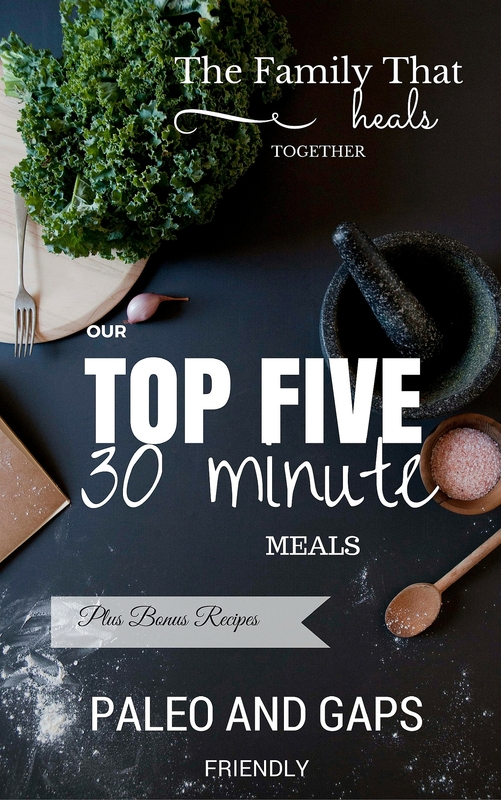 What’s a natural mama to do when we are constantly inundated with new information about how to keep our kids healthy? Below, I’ll tell you about the best choice for naturally-minded mamas in this post sponsored by My Green Mattress. Scroll to the bottom for a discount code! When I began to research about off gassing and mattresses, I was so disheartened by what I read: not only are mattress manufacturers required BY LAW to coat their mattresses in toxic chemicals, but searching for a non-toxic mattress only led me to ones that were way out of our budget. I felt trapped. I had no choice but to continue researching and wait to see what I could come up with. 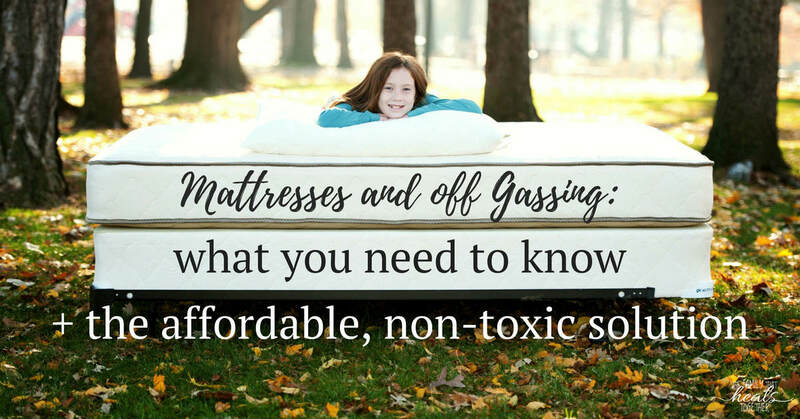 Thankfully, I came across a non-toxic mattress, with which I wouldn’t have to worry about off gassing, and the best part is that it cost only a fraction of what similar mattresses cost! First, what is off gassing? I’m so glad you asked. Off gassing occurs when new products are purchased and removed from their package. You’ll notice it with just about any product you purchase: new cookware, car seats, a new car, and, yes, mattresses. Depending on the level of toxicity and amount of chemicals used, a product may have off gassing for a short period of time, or a long period of time. This off gassing is responsible for the strong smell you’ll notice for a while after a mattress comes out of the package, but even after the smell is gone, off gassing continues. Mattresses can off gas even after 10 years! Mattresses, like car seats, are required by law to pass flame resistance tests. Manufacturers typically accomplish this by dousing the mattresses in flame retardant chemicals, which are effective for reducing flammability, but pose huge health hazards to consumers. Unlike other products that you use for short periods of time, we sleep on mattresses for a third of our life! For kids, it may be even more. Imagine, just snuggling up to those chemicals, rolling around in them, and absorbing them as you snooze. In addition, mattresses off gas from the materials they are made from, which may include industrial rubbers and petroleum products, adhesives, and unnatural fabrics. Is your head spinning yet? I know it’s difficult to navigate the toxic world we live in, but there are companies working to change that. I was so excited when I recently came across My Green Mattress. 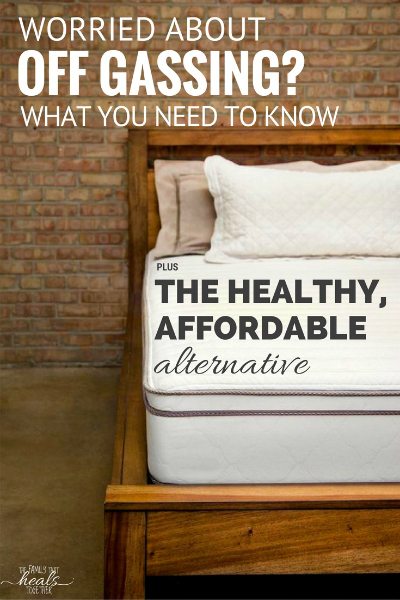 Not only do they make a mean natural mattress, but the mattresses are actually affordable. For the first time, I felt like a natural mattress, free of off gassing chemicals, was within my reach! Read more about their manufacturing process and materials used in their FAQ here. Not only does My Green Mattress offer wonderfully safe and non-toxic materials, but they offer an exhaustive process which allows you to choose the best mattress for your best rest. They have a range of options which include both single and double-sided mattresses, plus you can actually give them a call so they can walk you through picking your perfect mattress. Once you’ve made a decision, they get started on making your custom mattress, which you’ll typically be able to sleep on within a week. This rigorous and meticulous process ensures the utmost quality. I was so impressed to learn that My Green Mattress manufactures and sells their mattresses directly, which means savings for you. 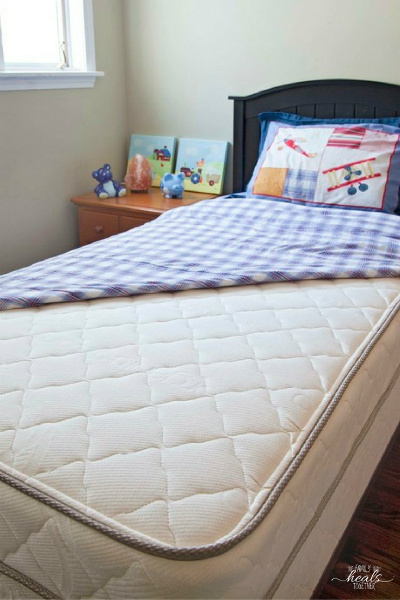 These impressive mattresses are created by a family whose own child suffered from eczema and chemical sensitivity, so they know how important it is to make non-toxic mattresses available for families who need them. My own son is very sensitive to chemicals, so I understand the necessity for providing a clean, non-toxic environment for sensitive kiddos. All the other mattresses I researched cost around $1000 or more for just a twin size mattress. I felt so overwhelmed adding up what it would cost to outfit our family with new mattresses, especially since our king size mattress needed replaced the most! With My Green Mattress, I can literally replace all the mattresses in my house for less than the cost of one king size mattress from other natural mattress companies. My Green Mattress offers mattresses ranging from $529-1499 (check them out here), but The Family That Heals Together readers can save 5%! Use promo code FAMILYHEALS when you click here to shop. There really is no better time to check out My Green Mattress if you’re in the market for a new, natural mattress that won’t make you worry about off gassing. Be sure to share this post using one of our links below so you can let your friends know about the harmful effects of off gassing. Herbal Pain Killer Shot for Headaches & More: Stop Taking NSAIDS! How would you compare them to Naturepedic? They seem similar to me, only priced lower.